Heat oil in a pan add ginger and garlic pieces.Saute till brown in colour. In another pan add 1 tbsp of oil and add three eggs.Scramble the eggs. Now add soya sauce and ajinimoto.Cook for 2 min, add salt.Then add the fried veggies. Serve it with hot chilly sauce or tomato sauce.The left over rice can also be used. PS:-Salt has to be adjusted according to once taste. Ah! Fried Rice is my favorite! They look simply great and yummy! 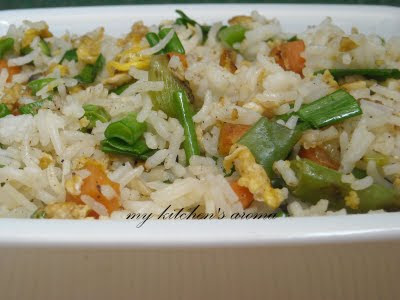 Am ready to finish the fried rice...tempting dish..
Easy n quick recipe liked by everyone in my family. 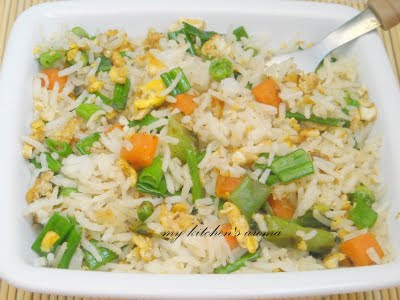 am drooling here....my fav fried rice..looks so yummy and tempting..
yum! one of my favorite dishes! did you use basmati? 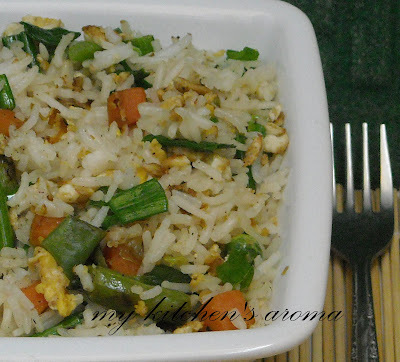 I love fried rice..looks yummy..I do the same minus egg..
regarding ur query for the cake plz chk this link whr u will get more details.If you have any doubts plz feel free to contact me regarding them. @Prathiba thanks will check the link.Since the day i saw ur cake i am looking for the bowls in my house to use it.Will get up back to u when doing it.